I have never befriended rhubarb. Not because of any particular scornful or contemptuous experience, but straight-up that I never even tried. Surrounding this strange celery-chard looking vegetable that bears as much resemblance to a fruit as a tomato does to a vegetable but which somehow passes as one in all of the best baked offerings in this balmy season were too many questions for this me of a stranger. Why is it sometimes pale green dirtied with half hearted contours of muddied red? And does that mean it’s unripe and therefore toxic to eat (in parallel with tomatoes)? Do I roast or stew it first before incorporating it into recipes, or does it soften at a compatible rate as the rate at which most pastries and batters cook? How well does it retain its bright red colour under heat? How acidic is it really? And this last one which for some odd reason gives me a level of unrest borderlining the societal anxiety associated with the oatmeal cookie raisin-vs-chocolate debate: are strawberries a must? As you can see, in the time I spent deliberating each of these questions, the following two recipes could have been sent well on their way in the oven. To further the iron content in all this, all of those questions were answered only after I got my hands gritty with two pounds of rhubarb. And the fruits of this new-found friendship, as you will soon discover in the recipes to follow, are worth the labour. So that got me thinking, maybe people are (just) like rhubarb? Such that as one actually makes the simple effort of adding a bit of warmth and sweetness to the equation, it solves itself, and the questions either melt away and become negligible, or are answered in the process? Line a square baking pan with parchment paper extending past the sides by at least 1 inch (this will act as ‘handles’ by which you can lift out the entire piece later for slicing). Place the flour, sugar, salt, and butter in the bowl of a food processor. Pulse until the mixture is even and very pale yellow throughout. With the motor running, add the water one tablespoon at a time, until the mixture begins to clump together. Dump the crumbly dough into the prepared pan and press it down firmly to form an even layer right to the edges. Stick the pan in the freezer to chill for 10~15 minutes as you preheat the oven to 375 degrees F.
Bake in the center of the oven for 20 minutes, or until lightly golden and the top no longer appears wet. Take it out to cool as you make the rhubarb curd. Place the rhubarb, cranberry juice concentrate, and sugar in a saucepan. Bring the mixture to a boil and continue to simmer until the rhubarb is very tender, about 20 minutes. Allow the mixture to cool completely. In a blender, blend together the rhubarb mixture (including all the liquid), cornstarch, eggs, and food coloring until smooth. Pour the mixture back into the pan and cook, stirring constantly, until very thick (the mixture is quite thick to begin with, so it’s safe to bring the mixture to a sure simmer, which also ensures that the starch-destroying enzyme alpha-amylase is gotten rid of). Pour the curd onto the baked shortbread base, smooth out the top with a spatula, and bake at 300 degrees F on the lowest rack for a further 30-35 minutes, or until only a slight jiggle remains in the center. Cool completely on a rack before putting it in the fridge to set overnight. To serve, loosen the edges by sliding a thin knife right along the sides of the pan. Grab the extended parchment handles firmly and lift the entire bar out onto a cutting board. Make neat slices with a straight-edged knife by running the blade under hot water and quickly wiping it dry before every slice. There’s no need to dust it with icing sugar as the bars will have produced a nice glaze on its own. Place all ingredients in a food processor or blender (if you are using a blender, make sure you put the eggs in first so the blender can run smoothly) and blend until as smooth and even as it will go. Transfer to an airtight container and refrigerate for up to 4 days if not using immediately. Preheat the oven to 375 degrees F, with the rack placed in the top third of the oven. Dust the pastry with flour and roll it out to fit the pan. Prick the pastry all over with a fork, leaving only the outer 1 inch un-pricked. Divide the almond cream between the two rolled sheets of dough and spread evenly, leaving the outer 1-inch bare. Arrange the rhubarb over the almond cream. 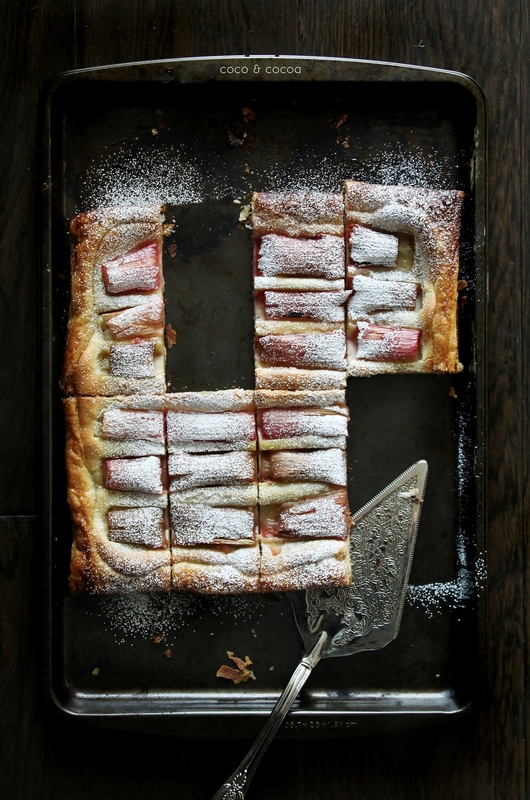 Brush the edges of the pastry with the egg and sprinkle sugar on the rhubarb and the brushed edges. 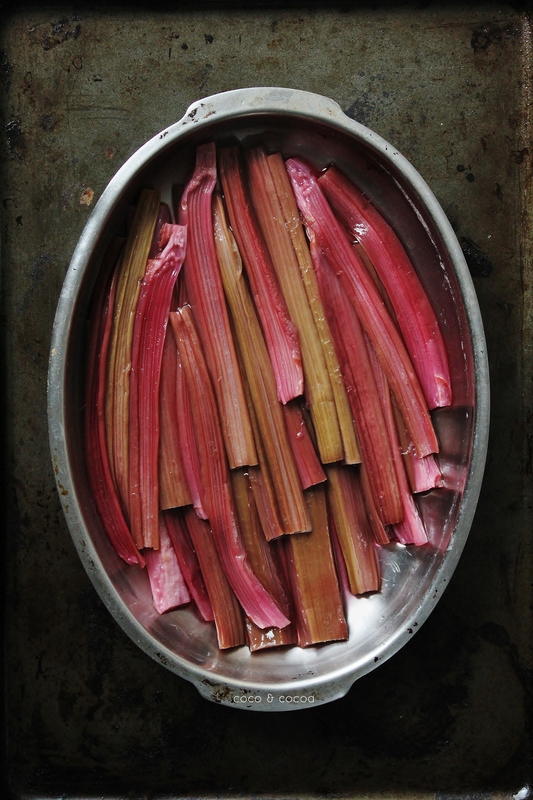 Bake for about 25 minutes or until the pastry is golden brown and the rhubarb is tender. Let cool before dusting with icing sugar and slicing. 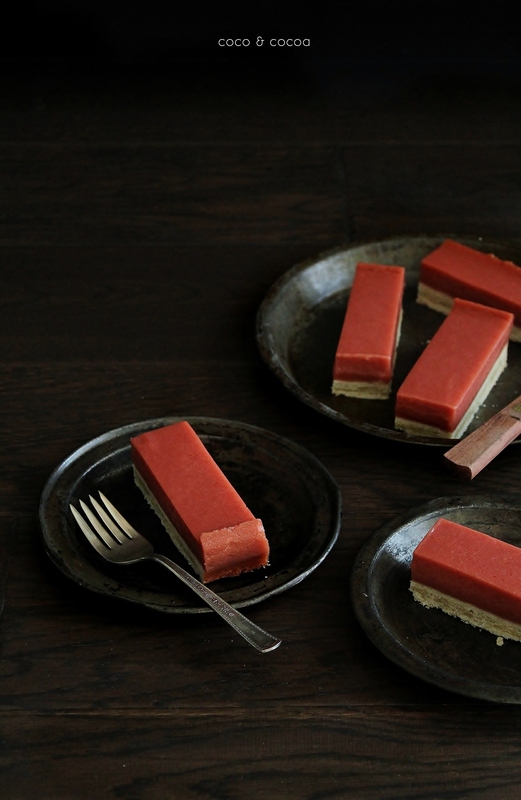 So many lovely ways to use rhubarb (which I love). Thank you so much Emma, I’m glad you stopped by! I don’t know if rhubarb is nearing the end of its season where you are, but if it is, make them quick!